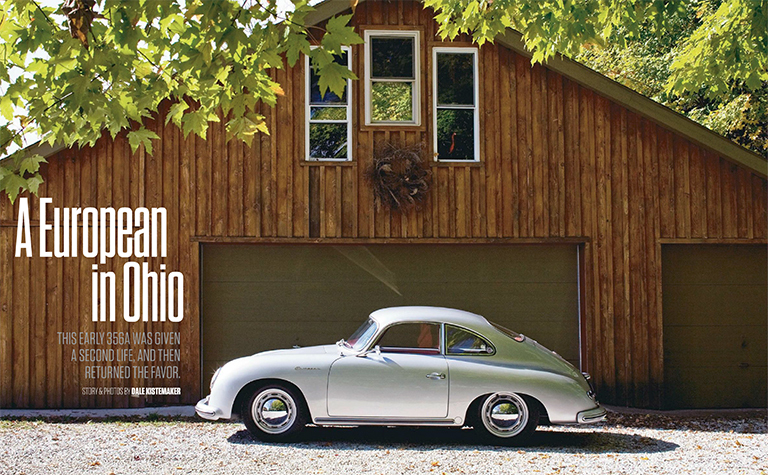 The July 2015 issue of the Porsche Club of America’s Porsche Panorama Magazine features my article “A European In Ohio.” Its an eleven page story and photographs about Mike Immarino’s rare and beautiful 1956 European scripted 356A Porsche coupe. Many thanks again go to Pete Stout, Editor; Richard M.Baron, Creative Director; Emma Ramshaw, Associate Managing Editor; and all the talented people who make Porsche Panorama possible. While this is my third article in Panorama the July issue was Panorama’s 700th! I am honored to be included in its long illustrious history. I’ve written more about Porsche Panorama here. Profound thanks also go to Mike Immarino, consummate Porsche restorer and all around great guy for allowing me access to his wonderful car and his air-cooled life. I’ll be back posting in early September. Enjoy your summer.